Presentation at the Trinity-workshop, Princeton University. Hördahl, P., Tristani, O., & Vestin, D. (2008). The yield curve and macroeconomic dynamics. The Economic Journal, 118(533), 1937-1970. Lombardo, G., & Vestin, D. (2008). Welfare implications of Calvo vs. Rotemberg-pricing assumptions. Economics Letters, 100(2), 275-279. Vestin, D. (2006). Price-level versus inflation targeting. Journal of Monetary Economics, 53(7), 1361-1376. Hördahl, P., Tristani, O., & Vestin, D. (2006). A joint econometric model of macroeconomic and term-structure dynamics. Journal of Econometrics, 131(1), 405-444. Gaspar, V., Smets, F., & Vestin, D. (2006). Adaptive learning, persistence, and optimal monetary policy. Journal of the European Economic Association, 4(2‐3), 376-385. Gaspar, V., Smets, F., & Vestin, D. (2006). Monetary policy over time. Macroeconomic Dynamics, 10(02), 207-229. Nessén, M., & Vestin, D. (2005). Average inflation targeting. Journal of Money, Credit and Banking, 837-863. Hördahl, P., & Vestin, D. (2005). Interpreting implied risk-neutral densities: the role of risk premia.Review of Finance, 9(1), 97-137. 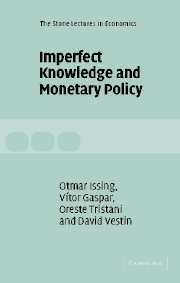 Gaspar, V., Smets, F. & Vestin, D. Inflation persistence, adaptive learning and optimal monetary policy, in Friedman, B. M., & Woodford, M. (Eds.). (2010). Handbook of monetary economics (Vol. 3). Elsevier. Gaspar, V., Smets, F., & Vestin, D. (2007, May). Is Time Ripe for Price (Level) Stability?,'. In Frontiers of Central Banking', conference Magyar Nemzeti Bank, May. Gaspar, V., Issing, O., Tristani, O., & Vestin, D. (2006). Imperfect knowledge and monetary policy. Cambridge University Press. Ekenberg, T. & D. Vestin (2018). Vad är pengar?, i Nationalekonomins Frågor. Studentlitteratur. Söderström, U., & D. Vestin (2015). Svensk penningpolitik, i Marknad och Politik, Hultkrantz, L. & H. Tson Söderström (ed). Studentlitteratur. 1998-2001 Ph.D. program, IIES, Stockholm University. Graduated May 2001. Thesis title "Essays on Monetary Policy", advisor: Prof. Lars E.O. Svensson. 1991-1994 Bachelor, Economics, Uppsala University.